I have recently received a couple of emails from followers of this blog wanting advice. I thought I’d answer them on here and maybe if more people have questions it can become a regular feature. Email me at nickbmorley@hotmail.com. I wanted to get started making linocuts at home. Do you have any advice on what I should get? Obviously lino (what type? ), ink (what type?? 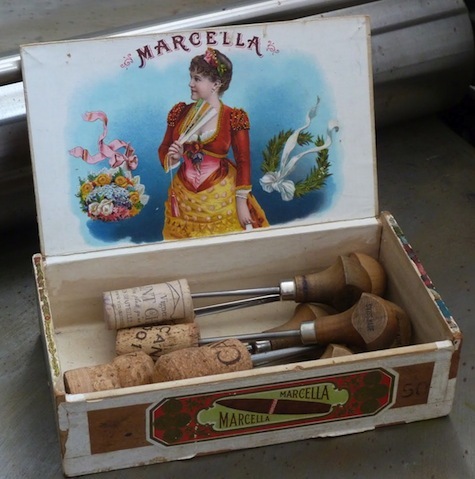 ), a roller, carving tools… anything I am missing or should be aware of? Well Simon, linocutting is one of the most accessible printmaking processes and can easily be done at home without too much space and too many specialist items. 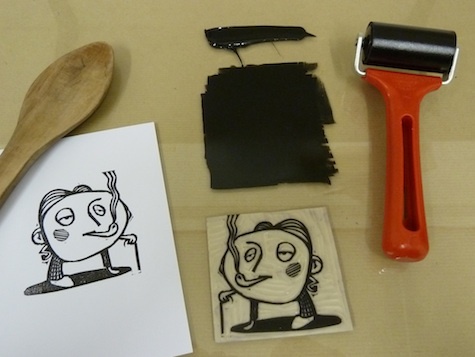 A basic set-up might consist of lino, one or two carving tools, a roller (‘brayer’ if you’re in America), ink, paper and a wooden spoon or baren for printing. There are a few options for which material you are going to carve. You can buy proper linoleum (made from cork dust and linseed oil with a hemp backing) from art supply shops. I have come across two colours, a yellowish-brown one and a grey one. There’s not much difference between the two, you might find one slightly softer than the other or a slightly smoother finish. If you buy a large piece and cut it down yourself you will save money in the long term. Some artists have found commercial flooring ‘lino’ that is suitable. This is not actual linoleum in the traditional sense, it’s made of a kind of plastic, but if you can find one that is smooth and cuts well, go for it! This will be cheaper than the artist’s linoleum. The other option is to buy a material known as vinyl. This comes from Japan and is custom-made for printmakers. It is usually green or green on one side and blue on the other. Both sides can be used. It costs the same or slightly less than lino (at least here in London) and is smoother to carve. It also has a very smooth finish which will give a smooth, even colour when printed. I find it a bit soulless and prefer the slight texture of lino but each to their own. It does not come in large rolls like lino, so there is also a limit to the size of print you can make from it. Buy the best you can afford. If you invest in a good quality tool and look after it it will last many years. If you are just starting out, try to borrow some or ask in the shop if you can try them out before you buy. There are two main types: one with a handle that is long and thin like a pencil and one with a mushroom-shaped handle. The pencil-type ones come from China and Japan and the mushroom handled ones from Europe. The tools are held differently and it is really personal choice which style works for you. The pencil-type tools are held a bit like a pencil, with the handle resting between your forefinger and thumb and the blade pointing away from you. I prefer the mushroom tools which sit in your palm as I find them comfier to handle. Good, sharp tools are so much easier to use than blunt ones but it is pointless investing in a quality tool if you don’t keep it sharp. I will try to write a post on sharpening tools soon! As a rough guide, at the moment a set of six basic pencil-type tools will cost around £10 ($15) in the UK. These are adequate for a beginner and I use them in my workshops. Avoid the style with the plastic handle and the removable blades. They are horrible. If you want to invest in a better set you might pay anything up to £25-30 for a Japanese tool. Mine are made by Pfeil in Switzerland and cost around £16 each. Carving tools – how many do you need? I have a set of 6 of which I use three the most. These are all u-gouges. If you are a beginner, I would recommend you get a large v-gouge and a medium u-gouge to start with. The v-gouge is the most versatile as you can cut a variety of width of line, including the finest lines. If you want to cut an even width of line, a u-gouge is easier. You can also use a scalpel to cut a line similar to the v-gouge but you have to cut each side of the line separately. If you want to clear large areas, a wider, flatter gouge will save you time. Buy inks for ‘relief’ printing. These are suitable for woodcut and linocut. You can get many different brands. These are available from specialist printmaker shops. You can also use industrial litho inks which will work out cheaper but only come in large quantities. Relief inks come in oil-based and water-washable varieties. If you are working at home you might want to consider the latter which can be cleaned up with soap and water. Some inks contain chemicals known as ‘driers’. These speed up the drying time of the inks. If your prints are taking more than a day or so to dry, consider buying some driers. You only need to add a drop or two to the ink when you mix it up. You will need a flat non-porous surface to roll out your inks on. A piece of toughened glass, perspex/acrylic, marble or an old piece of laminated wood would all work. A metal spatula is also useful for laying out the ink and mixing colours. Rollers come in a number of materials: hard and soft rubber, gelatine, plastic and nitrile PVC. Rubber rollers are great. Get one than has a bit of give when you squeeze it, but is not too spongy. The harder the roller, the less it will roll into all the dips and nooks in the lino. 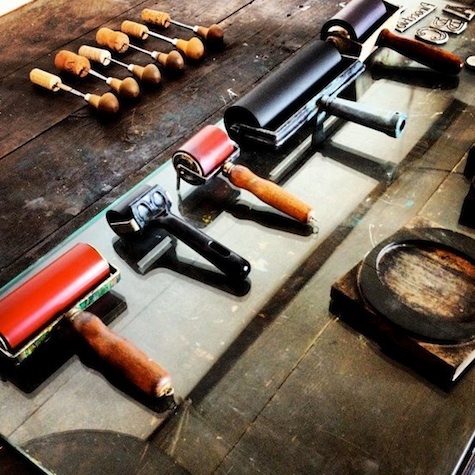 Ideally your roller should be big enough to cover the whole of your lino with ink in one roll. So, as well as the roller being wider than your block of lino, you will also need to work out the roll length, which is the same as the circumference (just over 3 times the diameter of the roller). If this is longer than the length of your block, you are OK. Having said this, you can roll up a large block with a small roller with a bit of practice without getting roller marks. A softish roller will make this easier. Always clean your roller immediately after use and dust it lightly with chalk or talcum powder to dry it. Which kind of paper you use will depend on your printing method. If you have access to a printing press you can use thicker paper. If you are printing by hand a thinner paper will be better. Japanese papers work well for this because they are thin but incredibly strong due to the long fibres in them. A smooth paper will give a flat, smooth print. Textured paper will make the colours mottled or even speckled. Experiment with different kinds of paper, but remember some papers are designed to last longer than others. Newsprint is lovely to print on but will yellow very quickly over time if left in the light. If you want your prints to last, use archival quality, acid-free or buffered paper. If you are printing by hand you can get perfectly good results with the back of a spoon. If you want to look a bit more like a pro, you can get a japanese tool called a baren. This is a hard disc covered in bamboo (there are plastic versions too) with a handle. You can protect the printing paper by placing a sheet of tracing paper or greaseproof paper over it before you print. 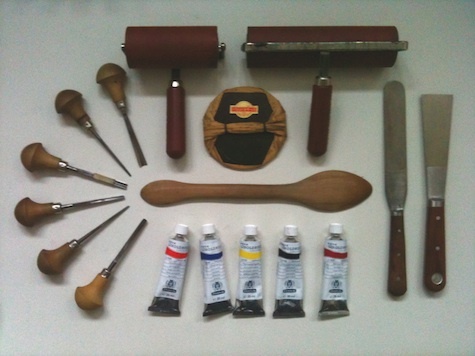 Intaglio Printmaker – tools, inks, paper. John Purcell paper (Brixton) – specialist papers. Falkiner Fine Papers (Victoria) – specialist papers including Japanese papers. Thanks! That’s so helpful for me as a beginner wanting to improve. Katie. Are you selling linocut kits yet? have ordered the 2 tool set and wonder if i might need more tools.i noticed you had a mention of a starter kit. I stumbled on your site whilst looking online for linocutting tips for a beginner, and realise we have one of your lovely works – Bear on a Bike – hanging on our wall. Great coincidence – he makes our family v happy. Very interesting and informative blog – thanks! I have recently started working in linocut. Currently at an artists residency, I have found some bits of this japanese vinyl (blue on on side, green on the other) you describe above. I would love to buy that, but can’t find a supplier online (I’m in Ireland) – your blog is the only place where I have seen any reference to it at all. Does anybody know where to find it? It has just the perfect consistency for me. The two sides also seem to be slightly different, with the green one being a little softer. Is it not possible to work in simple vinyl which is normaly used to put on the floor? It is cheaper than lino when you need big sizes. But I wonder if it is bad for your health when you carve in it? You can certainly use floor tiles. They tend to be harder to cut and may blunt your tools. The lino you get nowadays is made for artists and is much softer. I don’t think there would be any health issues carving vinyl tiles. For your information. Your link to Falkiners now appears to be broken. I think this is because they have been incorporated in to Shepherds. Thanks Simon, I’ve updated the link and location. Really been inspired, was considering joining a local class but as a creative type I reckon your blog has answered all the questions I really had. ~Really looking forward to my tools and materials to come through my letterbox and for me to start gouging! Great site, great info, many thanks. Lovely site! Just getting into linocutting and my teacher recommended using a bench hook rather than a non-slip mat for all cutting. I’m left handed and the bench hooks she recommends are for right handers so I’d rather do without. What do you think? Curious.. why do you have corks on your tools? I think it would be to stop them being damaged while being stored. I’d imagine they would get blunt pretty quickly if they were clattering against each other. Hi, how to you cut a big roll of Lino into straight squares? What tool would you use? Hi, where did you get the big roll of Lino from? I’m trying to find a white lino roll (matte or glossy), that is at least 2m wide and 3m long. Thanks so much for sharing your knowledge! I’ve been wanting to invest in some Pfeil gouges but didn’t know which ones would be essential. Your advice is gold! I have a question. I understand that this technique is mainly for printing on paper, but is there any variation for printing on wood? (a hard surface? -Maybe softer linoleum or other material for carving out on? Thanks for this informative site. Could you please let me know where you sourced the round burnisher shown in first picture? – Apologies if I misunderstood ‘burnisher’ in this context, though! I see there are many other tools that might also be burnishers. Thankyou Nick for going to the trouble of instructing us on beginning with lino cutting. I have been doing some at home with variable results and wondering what i was doing wrong. Now I have some idea! Thankyou for your thorough, methodical descriptions. Most helpful. I have made my own ‘Jap brayer’ using a flattish jar cork (about the width of the palm of my hand ) with a square of that soft compressed polyfoam fabric used for packaging. I simply wrapped it round the cork and secured it with a strong rubber band! It works really well. Looks like a mushroom wearing a tutu! If I get ink on it, I simply replace the polyfoam square. As a starter I find your blog extremely helpful – will send some more news when I get started. Many thanks to you – Rosemary Otter. Hi Nick, thank you for all the wonderful posts. I am hooked and very keen in getting started with Lino printing. I was wondering, could I use the inks for printing on fabric as well? I am interested in textile pattern making so any advice would be helpful. Will be checking up on your posts 🙂 thanks for sharing! Thank you so much for posting these tips. I wonder if you have a link to the tools (or a pic) you use for your workshops? (You say there is a set for around £10). I have searched high and low and so far have only been able to find the plastic handled sets, Japanese sets rather more expensive, or the hugely expensive Flexicut tools – which look great but too pricey for a beginner. Many thanks in advance. Think Jakar do a basic pencil style set, 6 for around 7 quid. Well, they do at my local art shop. For a beginner, you recommend a large v-gouge and a medium u-gouge. Which sizes of each in mm would be optimal? I am a beginnrer and just starting getting equipment together. Is a metal rolling pin any good to use as a baren so you could use your weight to apply pressure? The baren is the tool you need, as with it you will be able to focus the pressure in one spot much like you can burnish with the back of a spoon. This is something you cannot do with a rolling pin, as the pressure is too dispersed to be effective.